From DXLD today in case you missed it . Well at least CKZN St. Johns [also on 6160 @ 1kw] is still on (last I checked) , the one I can hear at my QTH. Fellas, from an insider at the CBC. Unfortunately, it doesn’t look good for CKZU ever returning to the air. 🙁 Thanks to Colin Newell for digging into this further. Got the answer.. not gonna like it. Basically, it broke and they don’t have parts to fix it because it’s too old and no parts available. The money required to purchase a new transmitter doesn’t make sense because of the low numbers of people who use it (changing world, everything’s online, blah blah). Before you say it, yes I know, I know. Anyway, there is no other way to voice your displeasure than the 1-866-306-4636 audience relations number. If enough people call, they might notice, but I doubt it. Sorry to be the bad news messenger. I kinda figured that was the deal of why it was off the air. This is sad news indeed for those who enjoyed CKZU. What amazes me, is how a 500 watt shortwave relay covered such a large broadcast footprint in British Columbia and western North America. On that note, I just discovered this post by Colin Newell (referenced above) on his blog, the Coffee Crew Blog. Colin mentions when he started listening to CKZU and what it meant to him. Check out his post. CKZU was a reasonably tough catch here on the east coast of the US–especially due to CKZN who shared the frequency–though I’ve heard them numerous times. Indeed, this will prompt me to go back a few years in my SDR spectrum archive recordings and tune them in once again–sort of a postmortem DX–? I’m sure I’ve captured them. As Dave mentions above, CKZN St. Johns is still on the air and, perhaps, listeners on the west coast will have a better chance snagging their 1 kW signal now. According to an article about CKZN in the latest WRTH, the station should be around for many years to come. Thanks again, Dave, for the tip and many thanks to Colin for the research. 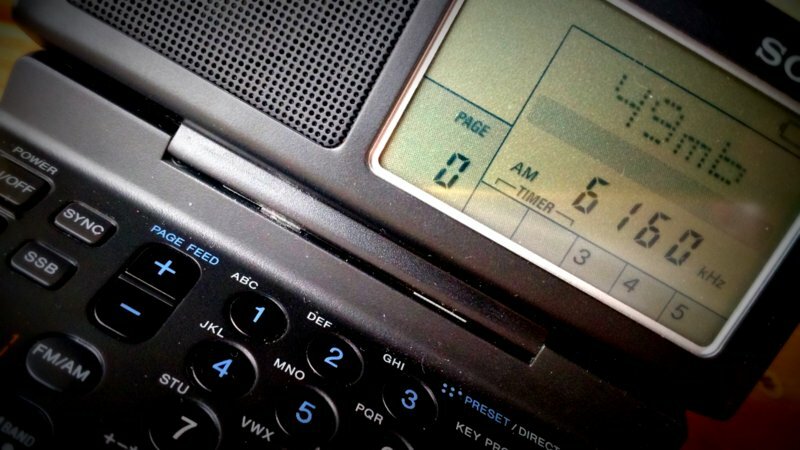 This entry was posted in News, Shortwave Radio and tagged British Columbia, Canadian Broadcasting Corporation, CBC, CKZN, CKZU, Colin Newell, Dave Zantow (N9EWO), shortwave on February 23, 2017 by Thomas. On Saturday August 5 we heard a test broadcast at 6160 KHz AM in English, early in the evening. They are going to broadcast for Ireland, the Netherlands, Belgium, Duisland and England. I have a video of this test broadcast. We have not discovered who is behind this radio station. I am a lifelong radio fan, Amateur Radio operator, and computer nerd. While I can appreciate the joys of the radio hobby, I can tell you without a doubt that like the rotary dial telephone or a crank start car, those days are long gone for everyone except the die-hards. There is absolutely no way that the CBC will ever be able to justify a new transmitter. The costs are just way too high for what is effectively a non-existent audience, and one the generally gets smaller all the time. You can do way more for way less online now, there just isn’t a point to it. As it stands, AM broadcast radio as a whole has almost reached the point of being price prohibitive. Most of the stations out there are running really old transmitters, on really old antenna arrays. When something breaks (like what happened recently with CKRW’s AM transmitter) they just move to FM. The only thing keeping stations on AM at this point appears to be the lack of suitable FM frequencies in a given market. FM transmitters are dirt cheap by comparison and of course, you have much better sound quality. Love it or hate it, the glory days of radio are gone. While it’s cool as hell to key up a mic knowing someone on the other side of the world might here you, the whole concept has been OTBE. It’s the fastest cart horse in a world full of 18 wheelers. Quaint on a Sunday parade, way out of it in day to day life. Sad to see this signal drop, but it’s a sign of the times. Yes, only three Canadian domestic SW transmitters left now (CKZN, CFRX, and CFVP). I managed to DX all of the domestics as a kid living in Toronto except for CKZU — and have the QSL cards as proof. 😉 I first heard CKZU on holiday in Hawaii a few years ago and was hoping to hear them again when I visit Hawaii this April. Sadly, that will now not happen. I grew up listening to 6005 kHz from Montreal, 6070 Toronto and 6130 from Halifax. Only one remains on the air these days, of course. “Listen while you can,” I suppose is the best advice. I was wondering why I had not heard them recently. I am fairly close to BC so they used to come in well but lately if I heard them at all it was weak. At least now I know ‘The Rest Of the Story’. Maybe we could set up a GoFundMe account to fix their ailing transmitter? Unfortunately, this is the trend of the future. I’m surprised shortwave radios are still being produced to this day at such a relatively large scale. Though I enjoy hearing shortwave transmissions on my radio, I find myself more and more listening to the world through Tune In or other apps on my iPhone. Being on an unlimited data plan with my cell phone service carrier makes it so much easier. In my office, I can stream anything I want to my Bose speaker in clear static-free sound. I still own a large number of radios. Eventually, I will get rid of most them.